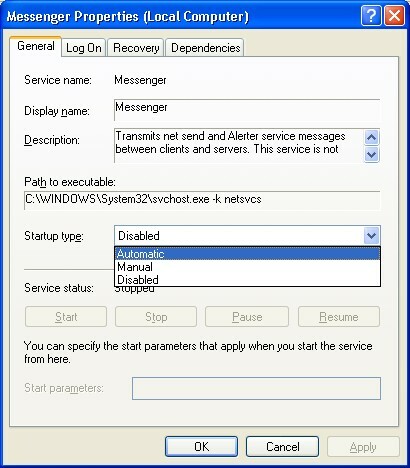 If you are using a version of Windows other than Windows XP, click on Start, then click on Settings, then on Control Panel. For Windows XP click on Start, then click on Control Panel. In Windows XP there is a link on the left side of Control Panel window. If that says "Switch to Classic View", click on that. If the link says "Switch to Category View", do not click on it. 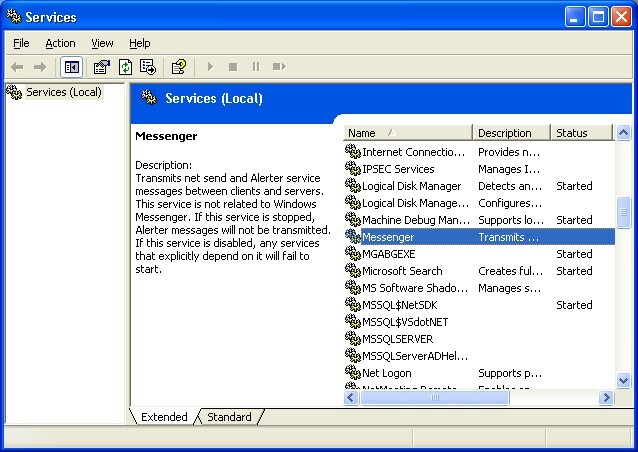 Click on the Administrative Tools icon in Control Panel, and then click on the Services icon. Scroll through the list of Services until you see the Messenger Service. Click on the name to highlight it. Right click on the name and choose Properties from the menu that appears. This is where we can stop the service and disable it. Click on the Stop button, and then use the drop-down arrow next to Startup type to disable the service.